Ordered the large long roughneck for my Glock 19 and I’m a bigger guy. Appendix carrying has never been so comfortable. Would recommend this holster to any bigger guy looking for a comfortable holster. It a very comfortable holster. I most definitely carry more now than before. Very satisfied. Broke in very well. Great product! It was received about 4 days after ordering. It is versatile in the sense it can be worn in our out of waist band and the strength of the magnet allows it to latch to many places such as the car door while traveling. 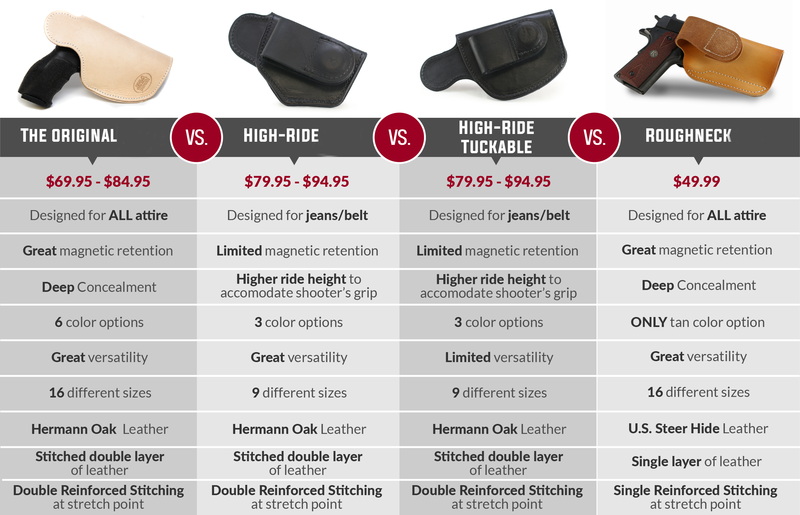 If you are looking for a great holster look no further! I did not get the roughneck after all.last minute changed to the orig and so happy i did.nice having the smooth interior to draw from. This is a great daily carry in a plain clothes leo capacity. While not a fast draw, it has limitless carry positions and I prefer it to a metal clip for most IWB holsters. it's rare that i take the time to leave a review, unless i'm very dissatisfied with a product, but this holster is great. i bought it for my glock 19 to carry AIWB, and it's very comfortable. i love the fact that it breaks in and will get better and better over time like a baseball glove. i've bought and returned dozens of AIWB holsters because they rub me in all the wrong places so it's nice to have finally found one that i like and can wear all day. these guys make a fine product. highly recommend. I always had difficulty finding an IWB holster. I tried this out for a few days and it's the best holster I have had out of everyone I've owned. And I don't have to wear a belt which is a relief.